Very interesting – I suspect few people really understand how Russian CB policies work. Thanks! Ravi, thank you…when I started this blog I aimed at not being US centric. I hope that I fulfill that purpose. Claim: An X% increase in oil prices leads to a (roughly) X% increase in currency inflows. Doesn’t the above make some pretty stringent assumptions about the world demand schedule for oil? Alex, it is in fact not a very heroic assumption as the oil supply in Russia is quite inelastic and historically the empirical currency flows and the oil price has more or less been in line with this assumption. I am sorry, but why are you saying that M2 dropped, if CBR had to buy ruble and sell foreign currency, which lead to drop in the Russian foreign currency reserves – doesn’t that lead to a bigger reserved of ruble?Why did the drop in the foreign currency reserves lead to the drop in M2? It follows from definition that the central bank’s liabilities will have to match it’s assets. The among the CBR’s assets is the foreign currency reserve. The money supply is on the other hand part of the CBR’s liabilities. So when the CBR sells foreign currency is reduces the foreign currency reserve and as assets and liabilities will have to match each other that will automatically reduce the money supply. Thank you for explanation, Mr. Christensen, now it seems clear. How do you think, except for the currency channel, what other channels of monetary transmission function in Russia? It seems to me, that CBR is rather dependent, and its monetary policy is affected by Russian government in a large degree. 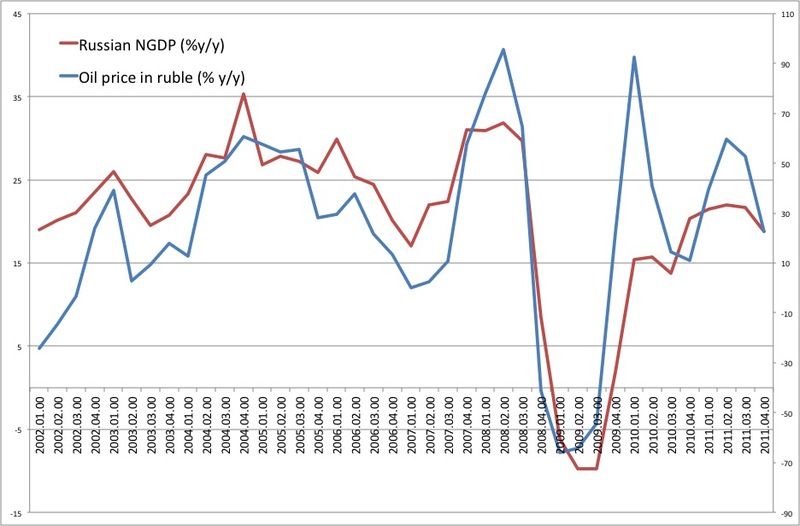 Could you explain the difference between each axis on the “demand shock” graph that you’ve posted to explain positive correlation changes in the price of oil (measured in ruble) and the growth of nominal GDP. Do you have a source for this data/graph? Thank you! Hi Lars, Could you explain the difference between each axis on the “demand shock” graph that you’ve posted to explain positive correlation changes in the price of oil (measured in ruble) and the growth of nominal GDP. Also, Do you have a source for this data/graph? Thank you! If Russia were to follow your currency exchange system it would become a Canada like economy, and they should replace Putin with the Queen as head of the state.